I like to add flavored coffee creamer to my morning coffee, but I’m not so fond of all the funky ingredients in the commercial versions. I figure if I can’t pronounce an ingredient then it surely can’t be very healthy. Don’t believe me? Check the ingredient label next time you shop. 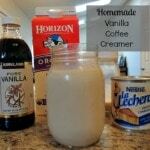 My Homemade Vanilla Creamer satisfies my desire for a flavored creamer without all the mystery ingredients. All it takes is 3 ingredients and 5 minutes – seriously, that’s it! And, I can pronounce every single ingredient! And the taste – rich, creamy and delicious. With the holiday baking season nearly upon us, now is the time to stock up on sweetened condensed milk. I’ve seen it on sale for as low as $1 a can. If you pick up a few extra cans, you can always make my Homemade Slow Cooker Dulce de Leche. I usually purchase the vanilla and Half & Half at Costco for the best pricing. 1. 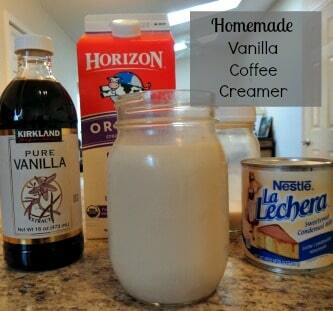 Divide the sweetened condensed milk evenly between the 2 mason jars. 2. Add 2 Tbsp. vanilla extract to each jar. 3. Add 1 cup Half & Half to each jar. 4. Stir until mixture is blended completely. 5. Store in refrigerator. May need to stir or shake before using. Divide the sweetened condensed milk evenly between 2 pint-sized mason jars. Add 2 Tbsp. vanilla extract to each jar. Add 1 cup Half & Half to each jar. Stir until mixture is blended completely. Store in refrigerator. Stir or shake before using. I’ve linked this recipe at: Full Plate Thursday at Miz Helen’s Country Cottage, Weekend Potluck at The Better Baker. This post may contain affiliate links. If you choose to click on the link and/or make a purchase, I will be paid a small amount which helps to support this website. Your price is the same, whether or not you use the link. This does not influence or change my opinion(s). Hi, I’m stopping by from menu plan Monday. I hope it’s not inappropriate to comment on a post that is from last year. Apologies if it is! Anywho, I was wondering how long this can be kept in the refrigerator while staying fresh. My daughter is the only one who would use it. If it has a short life span, do you think doubling the recipe would work? Thanks so much for your time. I would say 7-14 days, depending on how fresh your milk or Half & Half is – the fresher the milk product the longer it will keep. I hope this helps. Thanks for stopping by, Michelle! Yes, that helps dramatically. Simple answers help when I’m clueless. We are new to homemade recipes. I’m trying to show my daughters that most items can be made at home with basic ingredients. A few years ago, at age 36, I learned that you can bake a cake without a box mix. I was not happy with the skills I was taught at home… needless to say. Thank you so much for taking the time. Don’t be so hard on yourself, Michelle, but rather congratulate yourself on taking the steps to venture into the world of homemade foods. Trust me, you’ll get the hang of it in no time. My favorite homemade foods are salad dressings and seasoning mixes – so easy to make, taste great and save money. Have a wonderful day! LOVE this idea!!! Thank you so much for linking up at Tasty Tuesday! Your recipe has been pinned to the Tasty Tuesday Pinterest board! Please join us again this week!